My dad has a little bit of an unconventional job. He's the editor-at-large for a magazine and, for the last thirteen years, is the host of a fishing television show that airs on NBC Sports. The first day I heard the news that my father was going to be on television, I wasn't excited. I was in the eighth grade and struggling with the ability to carry on basic life skills such as, you know, making it through my final year of middle school. Something about my father now being on television and everyone knowing about it, well, that put a dent in my plans of surviving middle school. I was sure I was over. The following year, the boy that I had a crush on wore one of my dad's t-shirts to school on purpose to embarrass me and that was it, I was really sure I was over. But fast-forward a decade or so and I was first in line to volunteer Ethan to co-star with his grandpa. Funny how life works. The truth is, I know nothing about fishing. I used to negotiate with my dad when it came to going out on the boat: yes, I'll go with you on the boat, but only if you absolutely swear we will not stop, not even one cast, to fish. I don't even eat fish. There was that whole post-Finding Nemo era where I sat grumpily at my spot at the dining room table and declared "fish are friends, not food" repeatedly. As an adult and a parent, I can now appreciate how lucky my dad has been to make a career out of something he loves and the many bonuses said career has had, like the fact he was always able to be home with us during the day unless he was traveling. Or the fact he always supported my wacky endeavors and dreams because he knew all too well about people throwing the "why don't you get a real job?" card in your face. 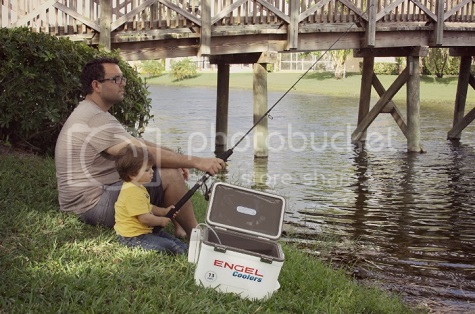 In the spirit of Father's Day, my dad recently recruited my husband and Ethan to do a photoshoot for a cooler company. My husband probably knows less about fishing than I do (cue my dad making some joke about him always snagging the trees when he casts -- which he did) but Ethan didn't seem to mind (or notice). 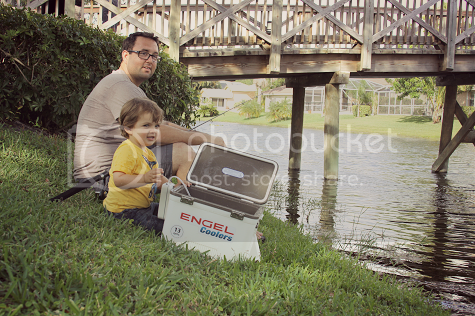 When this blog was brand new, my dad put together a fishing basket for me to giveaway to someone who wanted to surprise the fish-loving dad in their life. It was a huge hit and one I truly wanted to repeat last year but just got sidetracked what with June being a chaotic month of Ethan's birthday party planning and all that comes with that. (I'd intended to host this giveaway earlier this year so that the prize would be able to arrive in time for Father's Day but miracles don't happen overnight.) 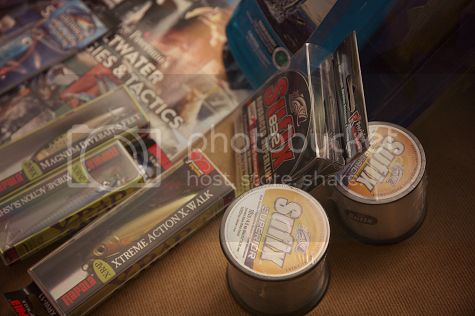 Still, my dad has put together a sweet little basket filled to the brim with all things fishing, ready to be won for that special fish-loving father in your life, whoever he may be! 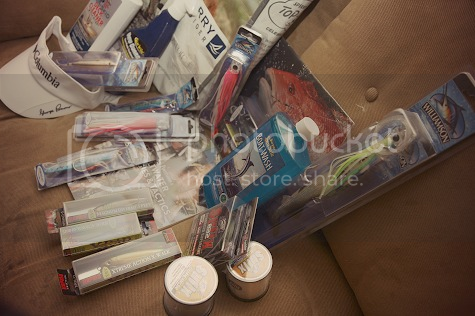 There are lures galore, fishing line, a George Poveromo (that's my daddy!) 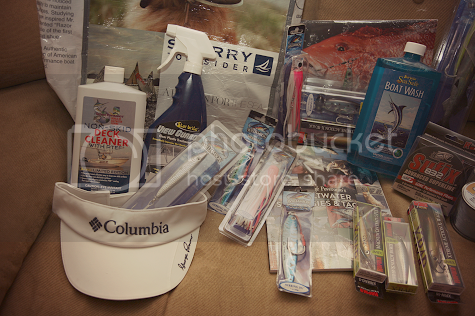 signature Columbia visor, a calendar, a textbook, boat wash and everything you could possibly need, a $300 ARV. 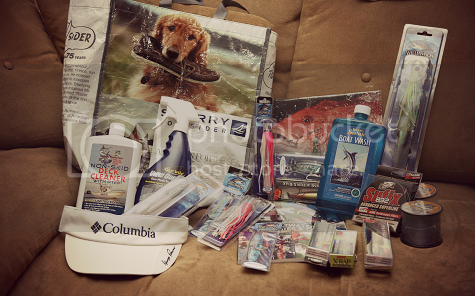 It's also all cutely packaged in a Columbia tote bag, too! My husband would die over this basket! It would be perfect for his "first" father's day! Sounds like your dad has a pretty cool job! I think everyone in my family would fight over this basket! My husband would definitely love it!! 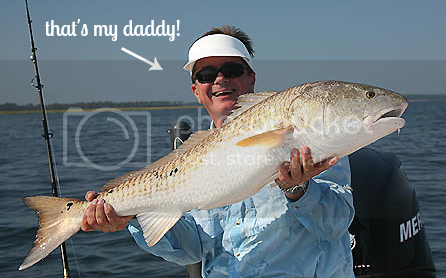 It would be totally perfect for our fathers day fishing I have planned!! How awesome of you! We aren't fishing people, but that doesn't mean we can't try. This would be an awesome way to try it. I would like to win this for my husband, he enjoys fishing and we are trying to teach my son. This would be for my father in law who loves fishing. my FIL loves fishing, they're even planning an Alaska cruise this fall. this would be a wonderful gift for him! 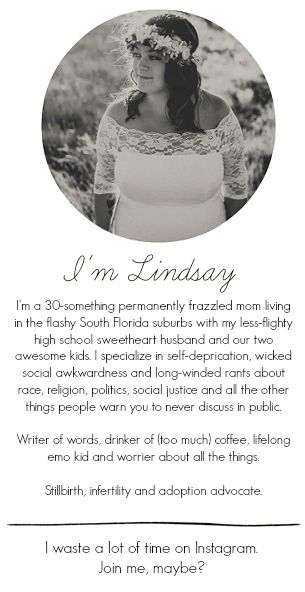 My husband would get a kick out of this. We are taking a special trip to a lake in August and I know he plans to fish there. My husband is an avid fisher and would just love this!!! my husband because he loves fishing! My Dad! Although my husband would probably fight him for it! Big fishermen in this family! Thank You for the giveaway! I'd say you have a pretty cool dad! My fiance would love this! This would probably go to my dad, but it might be a nice gift for my uncle too! Either one would love this. My husband and my almost-15 year old son love to go fishing. They would love to share this wonderful gift basket.